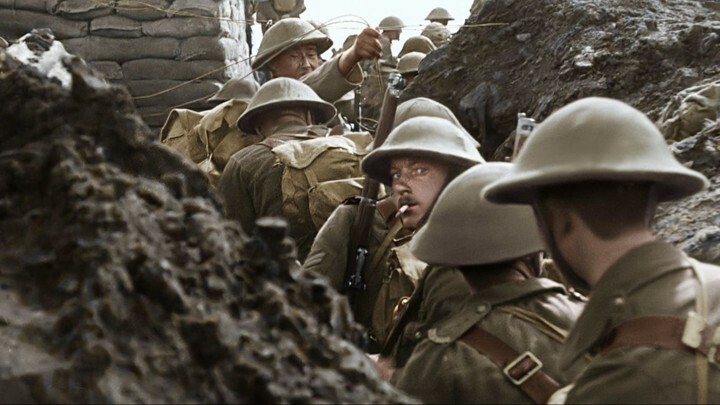 Peter Jackson’s They Shall Not Grow Old has been released in theaters to limited theaters and limited dates thanks to Fathom Events and Warner Bros. The limited one-day encore on January 21st screening helped the film earn $2.64 million, giving it a total of $8.34 million. Don’t worry, if you didn’t get a chance to see the World War I documentary on the big screen, you’ll get another chance when it opens to 500 theatres in 150 markets across the US and Canada, starting on Friday, February 1, 2019. And the best thing of all? It won’t be a one-day deal since it’ll be a regular engagement. World War II has been heavily featured in films, TV series, video games and documentaries like Saving Private Ryan, HBO’s Band of Brothers, and Call of Duty: WWII. Recently we’ve been seeing the spotlight on World War I like the multiplayer FPS game, Battlefield 1, and the live-action Wonder Woman movie. As for documentaries, WWI footage is hard to come by, and they were in black and white and in poor quality. Director Peter Jackson has decided to restore footage while also improving them with color, 3D and surround sound. They Shall Not Grow Old is an ambitious documentary that aims to immerse people into the first World War and experienced it like never before. When watching the film, I was wondering when the color and the widescreen format would kick in. The beginning portion is presented in black and white with an aspect ratio of 4:3, focusing on the moments leading to war which included enlisting, training and preparing for war. We hear stories of what the young teenagers did to enlist, which included fibbing about their age in order to join. Once the soldiers traveled to the war, that’s when the screen widened to the 16:9 ratio with full color. I’m glad Jackson decided to have the film be in black and white in the beginning because it really makes you appreciate the filmmakers’ efforts in restoring old footage. Imagine trying to turn old black and white WWI footage with little frames into a cinematic experience. They did a wonderful job with the colors and 3D, and it’s amplified with surround sound audio as you hear explosions and gunfire. The film is a must-watch for history buffs, and seeing the WWI footage being restored helps shine more light to the horrors of war. Jackson also uses actual audio from the survivors as they talk about their daily lives as soldiers. One example is what going to the bathroom is like during the war. If you’re in the trenches, where do you go? One scene explains that where there would be a makeshift log-like bench hoisted in the air. It’s out in the open, and the soldiers would defecate while sitting next to each other. All privacy is lost in that moment. They Shall Not Grow Old is a story about friendship and loss. You get to understand how the enlisted felt before the war, what they had to endure during the war, and what life was like after the war. Don’t worry, there aren’t long, drawn-out scenes in slo-mo like in the ending of The Lord of the Rings: Return of the King. I definitely recommend catching this one in theaters. If you stay after the end credits, director Peter Jackson takes you behind the scenes while also talking about his grandfather, who served during WWI. They Shall Not Grow Old returns to theaters for a regular engagement on February 1, 2019. The post They Shall Not Grow Old returns to theaters in February appeared first on Nerd Reactor.